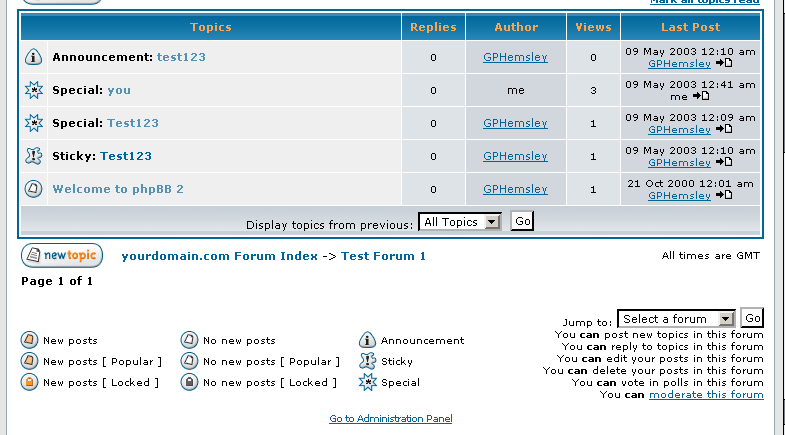 MOD Description: Create new topic types and manage pre-existing ones (like "Sticky" and "Announcement"). This MOD is compatible with phpBB 2.0.6! Last edited by GPHemsley on Sat Jul 14, 2007 5:41 am, edited 25 times in total. Very good idea of a mod, this is absolutely useful. Will report if any bugs would show up..
OK... Make sure that if you are creating more, you advance the numbers in the constants file each time.... See below. An error has been found by inlakefield in Version 1.0.1 and earlier. Last edited by GPHemsley on Sun Sep 07, 2003 4:26 am, edited 1 time in total. There is something that you have to do in Version 1.0.2 and earlier. You have to edit the mod_install.php if you are making something that is not named Special or if you make more than one new type. See below. (which appears twice) must be changed in mod_install.php to reflect the type you've created. Last edited by GPHemsley on Wed May 14, 2003 1:39 am, edited 1 time in total. While this is true (for version 1.0.0 at least), please refrain from trying to 'imitate' the mod db. I wasn't trying to imitate it.... I would think it's obvious that this isn't officially released, considering that message, who released it, and where it was released..... I was just trying to provide the same amount of useful information that John does when he releases them. Be sure to read all above updates. I just wanted to make sure this stayed on the first page.... Many people may need this. This is an update to a fix I posted above. Remember this is for Version 1.0.2 and earlier. This will be included in Version 1.0.3 and later. I think there are muny uses of it. Any chance of developing it so that any posts get changed to this Topic Type will be save into a special page on that particular board (or special borad), like some kind of keeping useful topics mechanism?